The Skool (or ‘Soft Kool’ as it is dubbed by the brand’s UK distributor Kai Sports) is a range of four boards modelled around the Nah Skwell Kool series, yet produced in full wood sandwich technology with a full rail wrap EVA soft deck. The 10’8” is the largest in the Skool line-up and has a flattened squash tail for extra stability and ease. One of two hard WindSUPs on review here, the Skool feels solid and dependable in its wood sandwich construction, layered with a full EVA deck to make it forgiving and grippy for use by the whole family (even the family pet, according to the brand’s literature). There’s an extra EVA strip along the board’s rail to act as a guard or buffer against impact and paddle strike; a towing eyelet in the nose and leash eyelet on the tail. Supplied with a swept-back glass-fibre 27cm Powerbox fin (and a hand-screw to fix it in place – no need for a screwdriver), the Skool doesn’t offer a central fin option, meaning it converts to WindSUP mode by simply screwing the deckplate into the insert in front of the carry handle. With the group made up predominantly of inflatable SUPs, it was really interesting to step back on a hard SUP. Its lower quoted volume is instantly noticeable, the board sitting deeper in the water. It is however no less stable than its air-filled counterparts, the flat deck providing comfort and stability, whilst the complete EVA pad offers excellent traction. Used with a paddle the Skool is very user-friendly, slipping smoothly through the water, the squash tail design really helping the rider to move their weight around confidently to accentuate manoeuvring techniques. Without the option of a central fin, the Skool can’t help but have limited appeal as a true entry-level windsurf board. With that as a given, it is fair to say that the board tracks well for a more experienced pilot. Using understanding in edging the board on its rail, its parallel sides gripping well as the board glides to its goal. It is also easy to experiment with larger fins to enhance upwind performance thanks to the Powerbox and hand-screw in the tail. 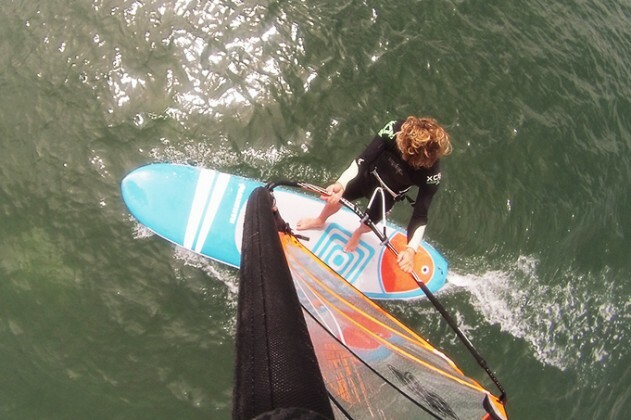 Capable of catching waves with ease, it is a great deal of fun for making the most of small soft waves (in both SUP and windsurf mode), the width and support in the tail again playing its part in forgiving clumsy footwork. And when the wind fills in the Skool accelerates smoothly and releases onto the plane well, increasing its capacity to entertain … and its appeal as a result.